In the past months I have written several times about the Matrix component I developed for ADF Faces to be used in several of our projects. Yesterday I demonstrated this component in my presentation at OOW 2007 on ADF Faces. This morning I decided to take a look at the new PivotTable component that is available in ADF Faces 11g. I am curious to see what it can do, what it looks like, how difficult it is to set up and how my work compares to it. In this article I will present some of my conclusions and demonstrate how you can quickly setup a ‘pivot table’ or matrix in your ADF Faces (11g) application. Let’s go through a step by step example of creating a pivot table that will present the number of staff and their combined salary per Department and Job combination. Obviously this stunningly useful matrix is based on the EMP and DEPT tables in the SCOTT schema. It is also the example I used when presenting the matrix component I created in an earlier Blog article. Add the view object HrmPivotView to the ApplicationModule’s DataModel. 4. Drag the HrmPivotView collection from the DataController palette to the new JSF page. 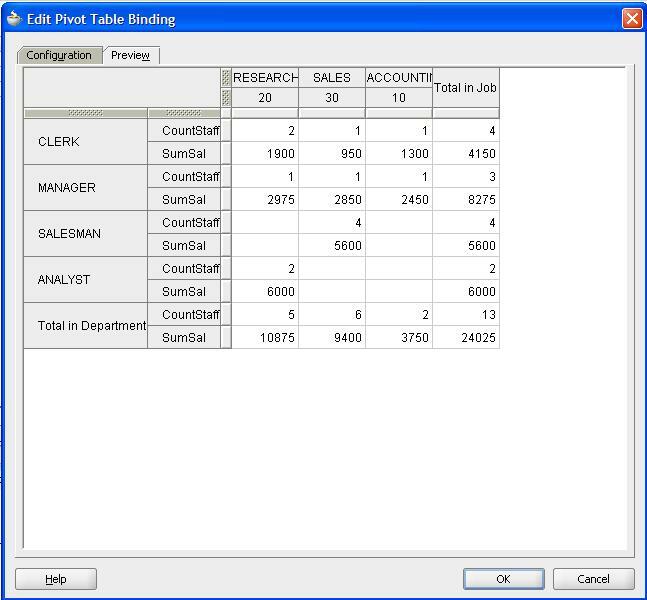 Drop it as an ADF Pivot Table in the Tables category. 5. 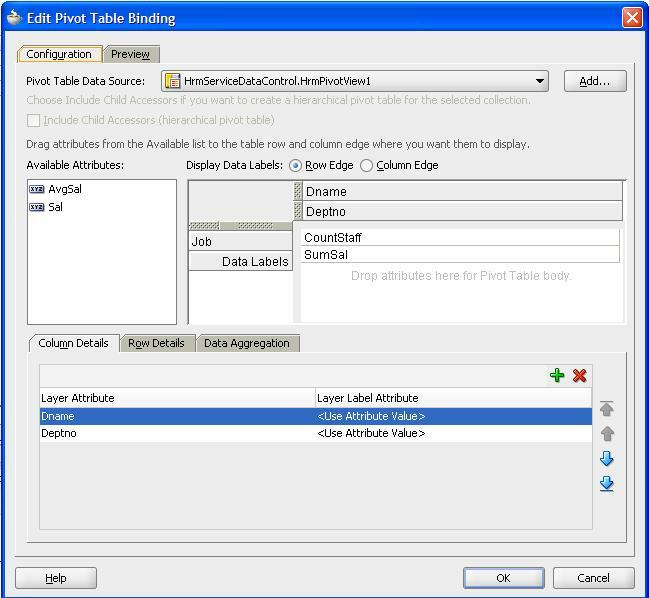 The ADF Pivot Table Data Binding editor opens. Here we will specify what the matrix should display for its rows, columns and cells. From the list of Available Attributes, drag Dname and Deptno to the Column Edge. Next drag Job to the Row Edge. Finally drag CountStaff and SumStaff to the cell area. We would like to have both column and row totals. The column total shows the sum of the cell values within the Department – so it gives us the total number of staff in each Department as well as the total Salary Sum in the department. We get this by adding an entry on the Data Aggregation tab. Select Dname as the attribute – to link the aggregation to the Dname column – and pick Sum as the Function and After as Aggregate Value display – to show the column total at the bottom of the column. For the row total – the sum within the Job – we do something very similar: add an aggregation entry, select the Job attribute, select the Sum Function and After as Aggregate Value Display. Also set a the Aggregate Value Label to indicate what it is you are looking at in this row total column. Note: we can use only a single aggregation operator for the entire row or column. In this case where we have two data values – count of staff and sum of salary – it is okay to use sum for aggregating both of them. However, if my data values would have been count of staff and average salary, that would have been different: for count of staff, a sum aggregation is desirable, however for Average Salary, an overall Average is the wanted aggregation. And that seems not be possible: both data values are subjected to the same aggregation operator. 7. Time to run the page and be amazed. Amazed? Well, it looks nice but it is what we configured and previewed, isn’t it? What is amazing about it? to the row header section and drop it. when I try to drill.